To automatically flight players, on the Tools menu click Automatically flight players. Drop down the Determine flights using box to select how you wish to flight players. TM can automatically determine flights by player’s handicap, index, gross score, or net score. Usually you flight players by index or handicap, but flighting players by gross or net scores can be useful if you are running a multi-round tournament, and you need to flight players by scores shot in previous rounds. A tournament can have up to 26 flights. If you need to apply the flighting setup to only men or ladies, drop the box and select Men only or Ladies only, otherwise leave Men & Ladies as your selection. For example, if the men and ladies have different ranges for flights, you would want to set the flight parameters differently for each gender. TM can automatically set the ranges for each flight and flight players accordingly. Click the Automatically set ranges above button and TM will try to determine flight ranges by putting an equal number of players in each flight. Click OK to close the form and apply the flights to your players. Note: TM will set the boundaries for each flight and try to put an equal number of golfers in each flight. But, it is not always possible to put an equal number of golfers in each range. For example, if you were flighting by handicap and you have 100 golfers and 4 flights, then you want 25 golfers in each flight. However if 30 of the golfers have a handicap of 10, then at least one flight must have 30 golfers and the rest something less. TM simply puts an equal number of players in each flight. Click the Iqnore ranges…put equal number of players in each flight button and TM will simply put an equal number of players in each flight. Click OK to close the form and apply the flights to your players. Note: TM automatically flights your players with an equal number of golfers in each flight regardless of flight handicap, index, or score boundaries. For example, if you were flighting by handicap and you have 100 golfers and 4 flights, then you want 25 golfers in each flight. TM simply sorts your list by handicap and puts the first 25 golfers in flight A, next 25 in B, next 25 in C, and last 25 in D. Note that if golfer 25 and 26 both have a handicap of 10, you will have a 10 handicap golfer in flight A and a 10 handicap golfer in flight B. You can manually set the flight ranges and TM flights players accordingly. In the Flight Ranges table, type the High Range for each flight. 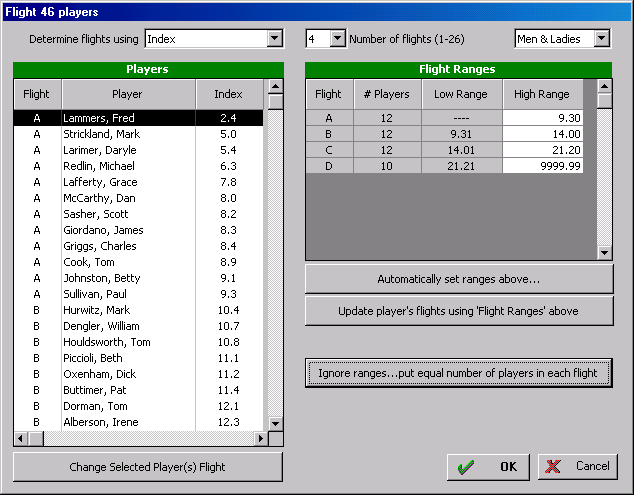 The number of players in each flight is automatically calculated. TM will use the range you type for each flight to determine each player’s flight. Click OK to close the form and apply the flights to your players. Select a player or range of players in the Players list. Click the Change Selected Player(s) Flight button or right-click the player to set the flight. Remember, you can select a range of players by clicking and dragging your mouse to select multiple players, or by holding down the SHIFT or CTRL key. Tip: Many tournaments are run so that a player's flight is determined after the first or second round. For example, assume you are running a 2 day tournament with 100 players. The first round will be a qualifying round to determine four flights and the second day you will have flight winners. To automatically flight players based on previous round's results simply set Determine Flights using to gross or net score. To automatically flight teams, on the Tools menu click Automatically flight teams. The Flight Team form will appear. Flighting teams works exactly the same way as flighting players. See above for details.